An extraordinarily spacious family car with an interior illuminated by an unusually large glass roof – that’s the new Peugeot 307 SW. THE 307 SW MODEL differs from the basic 307 thanks to its extended wheelbase, which is 10 cm longer and measures 2.71 m, its new, more voluminous back, and an overall length of 4.42 m, 22 cm longer than the basic 307. The seats can be arranged in three rows, 2+3+2. The second-row seats are separate and can slide forwards and backwards, and the narrower middle seat can be folded down or completely removed, just like the two smaller seats in the third row. With five travelers there is 0.56 m3 of luggage space, which can be expanded by folding down the back seats to 1.53 m3 (measured to the ceiling). 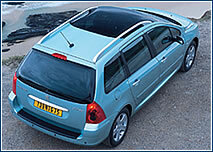 A unique feature of the Peugeot 307 SW is the glass roof, which is linked to the windshield and extends back over the second row of seats. Peugeot’s latest is available on the Czech market for CZK 580,000, with a 1.6-l, 110-hp (80 kW) gasoline engine, or for CZK 630,000 you can get either a four-cylinder, 2.0-l (138-hp/100 kW) gasoline engine or a 2.0 HDI, 90-hp (66 kW) turbodiesel engine. The top of the line is the 307 SW model with a more powerful 2.0 HDI, 110-hp (79 kW) turbodiesel with a particulate filter (FAP), and it costs CZK 680,000. Both HDI versions average only 5.4 liters of diesel fuel per 100 km and reach top speeds of 174 and 183 km/h respectively, while the most powerful, 2.0-l gasoline model can reach 200 km/h. 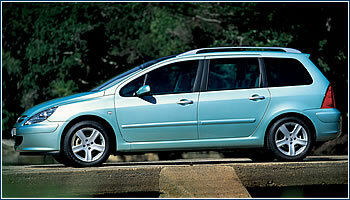 If the Peugeot 307 SW seems too unusual or too expensive, the five-seat 307 Break station wagon has a more traditional concept but the same interior space. It comes with a four-cylinder, 1.4-l, 75-hp (55 kW) gasoline engine and sells for CZK 450,000, or a 1.6-l engine for CZK 485,000.